The Senate Judiciary Committee chairman has said there is "no hint of misconduct" by Supreme Court nominee Brett Kavanaugh in a confidential FBI report. Donald Trump's choice for America's highest court is facing allegations that he sexually assaulted Prof Christine Blasey Ford at a house party when they were teenagers. Testifying before the judiciary committee last week, Prof Blasey Ford said one night in the summer of 1982, an inebriated Kavanaugh forced her down on a bed, "groped me and tried to take off my clothes," then clamped his hand over her mouth when she tried to scream before she was able to escape. She told the panel she thought Mr Kavanaugh was going to accidentally kill her. Speaking through tears, Mr Kavanaugh furiously denied allegations of sexual assault, accusing Democrats of orchestrating a "grotesque and coordinated character assassination". He said the claims had put him "through hell, and then some" in the last fortnight, and warned "the whole country will reap the whirlwind" if they are allowed to prevent his nomination during the historic hearing in Washington, DC, which was broadcast live to millions of Americans. After the session, congressmen examined an FBI report into the alleged sexual abuse, as the US Senate's Republican leadership scheduled the first confirmation vote for Friday. 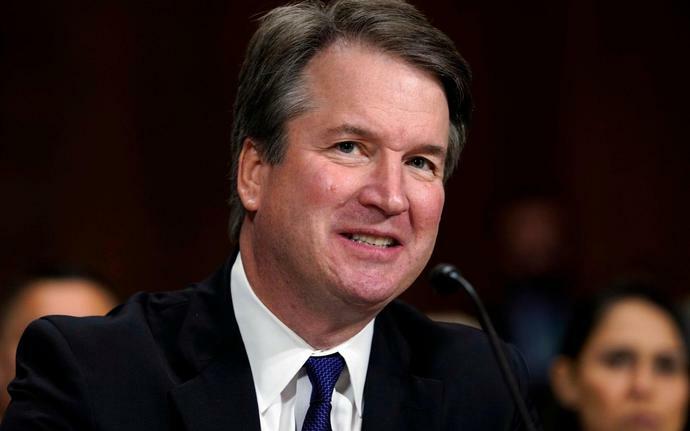 It appears the conclusion is that Mr Kavanaugh has no case to answer, paving the way for him to be sworn in as a Supreme Court judge. Kavanaugh has strongly denied Prof Blasey Ford's assertions and those of two other women, who have accused him of other instances of sexual misconduct in the 1980s. The new investigation into his conduct has come under fire for its limited scope. "An FBI supplemental background investigation that did not include an interview of Prof Christine Blasey Ford - nor the witnesses who corroborate her testimony - cannot be called an investigation," Ms Ford's lawyers said in a statement on Wednesday night. "We are profoundly disappointed that after the tremendous sacrifice she made in coming forward, those directing the FBI investigation were not interested in seeking the truth." The Senate is now braced for a crucial initial vote on Friday on Mr Kavanaugh's Supreme Court nomination, with a showdown roll call over confirmation set to take place as early as Saturday. With Republicans clinging to a razor-thin 51-49 majority and five senators - including three Republicans - still wavering, the conservative jurist's prospects of Senate confirmation remained murky and highly dependent on the file's contents, which are supposed to be kept secret. "There will be plenty of time for members to review and be briefed on the supplemental material" before Friday's vote, Mr McConnell said to the nearly empty chamber.